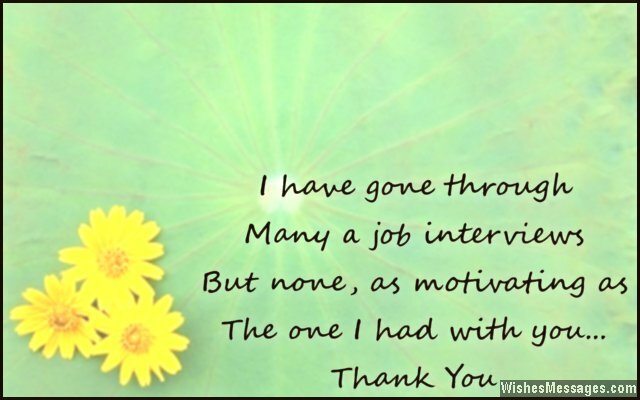 Thank You Messages for Job Interview: Sending a Thank You note to an interviewer is not compulsory. However a carefully worded message has the potential to cement your professional image in the mind of the person who has the power to give you a new job. A courteous text or an email can help you work your charm in the most professional manner. Your polite message to express gratitude will also be the perfect way to subtly follow up after the interview. 1) I have gone through many a job interviews. But none, as motivating as the one I had with you. Thank you. 2) Regardless of the outcome of this interview I would like to thank you for giving me a chance to pitch how my skills and talents can add value to a company for which I hold high regards. 3) It was a pleasure meeting you and getting to know your thoughts about how the industry’s rapid transformation affects the requirements of skills that professionals like me need to be armed with. Thank you. 4) What may have been just another job interview for you turned out to be a highly motivational conversation that will help me shape my vision and move forward in my career. Thank you. 5) I hope we have the chance to continue our invigorative discussion about the challenges that our industry faces. Thank you the interview. 6) The fact that I got a chance to step into the esteemed corridors of a world class company to give an interview is an achievement that I am proud of. Thank you for giving me this wonderful opportunity. 7) Our job interview turned from being just another monotonous protocol interview to a vibrant discussion about our professions, for which I would like to thank you vehemently. 8) I am grateful to you, for giving me the opportunity to explain how I can contribute to your team. Just knowing that a global company like yours sees my worth is an accomplishment that motivates me to do better. Thank you. 9) I hope the job profile is as exciting and challenging as the interview that we just had. Thanks. 10) Being interviewed by some of the best professionals in the industry itself has become a feather in my cap. Thank you for your time. 11) I feel a sense of pride in knowing that your team recognized my past achievements and gave me an opportunity to explain how I can be an asset for your company. Thank you. 12) The job interview was nothing less than an enlightening professional experience that I will draw from. Thank you. 13) In a perfect world it may take a confident candidate to win the hearts of an interviewer. But in reality it sure takes a patient interviewer like you to put a nervous candidate like me at ease. Thanks so much. 14) Sitting in front of a team of highly qualified professionals like yourself was a milestone in my career by itself. Thank you. 15) Thank you for a highly professional, proactive and productive interview. 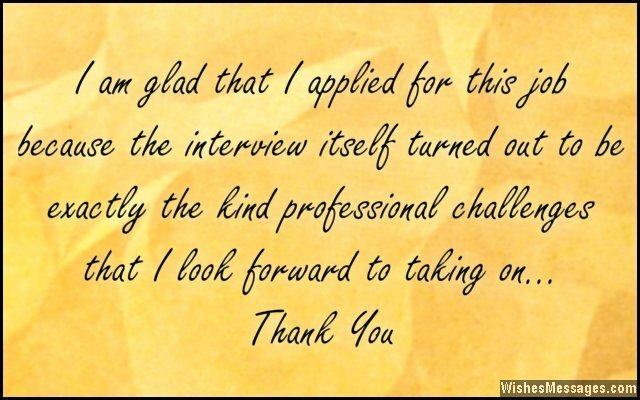 16) I am glad that I applied for this job because the interview itself turned out to be exactly the kind professional challenges that I look forward to taking on. Thank you. 17) I have always considered myself to be a go-getter because I believe that life’s greatest lessons come in the form of challenges – this job interview being the prime case in point. Thank you. 18) I always knew that interviews were supposed to be challenging and tough, but I never knew they could also be fun and interesting. Thank you. 19) Thank you for considering me among the hundreds of other potential candidates for this job. I am hoping that the skills I brought to the table during the interview were the level of potential that you were looking for. 20) I have always believed that every opportunity has the potential to be a life-changing experience and a prize in disguise. This job interview is an opportunity that I am glad to have had. Thanks. 21) This job interview by itself has been a turning point in my career. It has shown me the exciting array of possibilities that lie ahead. Thank you. 22) The job interview turned into a conversation that piqued my professional interests. Thank you. 23) Thank you for taking the time to review my application for a position in your company. I look forward to hearing from you soon. 24) This wasn’t my first job interview but it was the first one which allowed me to present my qualifications for a job profile that I consider a perfect fit, for my career growth as well as the company’s benefit. Thank you for the opportunity. 25) I would have missed out on a massive life lesson if it weren’t for the stimulating conversation we had during our interview. Thank you. 26) Being interviewed by an esteemed panel of qualified professionals in a reputed company was an experience that I am proud to have had. Thank you. 27) Thank you for putting me to ease in a situation that I found myself unfamiliar with. 28) I would like to take the opportunity to say that applying for a job in your company has been a thoroughly professional and highly motivational experience. Thank you. 29) Thanks for inviting me to explore an exciting professional challenge. 30) Thank you for turning a seemingly unnerving job interview into a discussion that has opened up a new dimension in my professional vision. 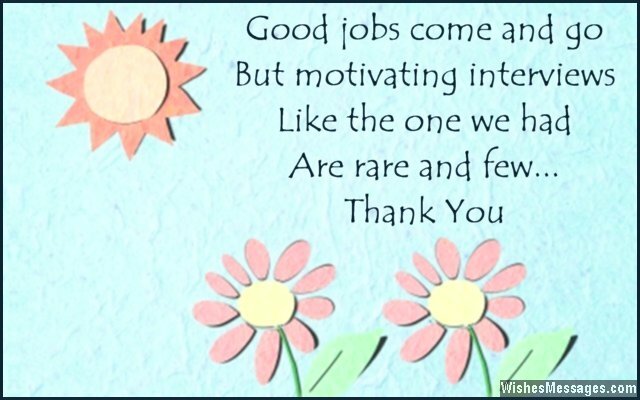 31) Good jobs come and go but motivating interviews like the one we had are rare and few. Thanks. 32) I have always believed that life is full of wonderful opportunities and learning experiences. This job interview was the perfect example. Thank you. 33) I could still go on and on about why I want to work in a company like yours but I think I have put my point across during the interview. So now I just want say, thank you. 34) Just the fact that you agreed to interview me reaffirmed my belief that anything is possibly if you try hard and persist. Thank you. 35) For a management position I expected this interview to be a tough challenge. Thanks for making warm and friendly instead.